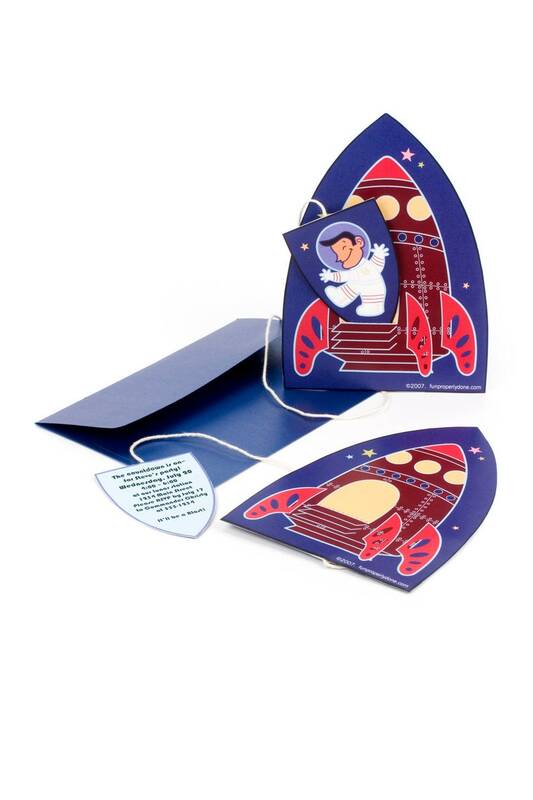 Kids will go into orbit over this invitation—the paper astronaut goes for a space walk while tethered to the main party capsule. Set also comes with asteroid name tag and thank you card featuring a photo of your UFO (Unidentified Friend O'mine). Comes with software to easily print on the invitation, if you like. DIY kit includes all materials (pre-printed paper, string, envelopes) to make invitations, thank you cards, and name tags for 10 guests. Bonus: Good Manners Guide teaches kids basic birthday etiquette (like how to write the perfect thank you note!). This listing is for an “Eti-Kit”—a DIY kit that comes with software to easily print on the card, or if you like, hand write your invite. Includes all materials: pre-printed paper, CD with instructions and printing template, string, and envelopes. Great project to make with kids!